Anyway, since then Lunenburg has become one of my favourite places to day trip to. In just under an hours drive you are in a place that feels far away from the bustle of every day life. Over the summer we stumbled upon a hidden gem of Lunenburg. The place where the Bluenose II is being rebuilt. Yes this may not seem like breaking news but we had no idea you could go in and watch this piece of history get rejuvenated. Visiting this site is completely free and there are always staff members willing to talk to you about every aspect of the boat – old and new. While very little of the original Bluenose II remains, the fact that you can watch a boat of this size, built with this amazing craftsmanship is an opportunity that most don’t get in their lifetime. 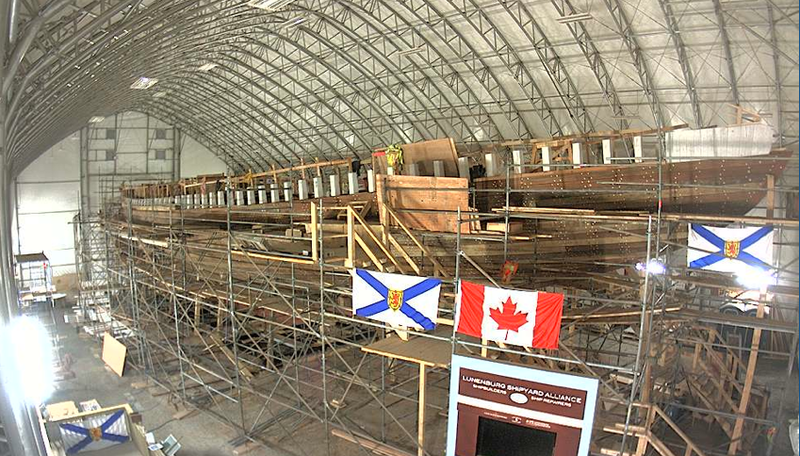 Once you’ve been hooked on watching it’s progress in person, you can check out the build live on Nova Scotia Webcams. The restored Bluenose II will be back in action in the Spring of 2012 just in time for Tall Ships!